Located in the heart of Nanaimo on Bowen Rd next to Kool & Child and Island Home Furniture. Did you know that indoor plants can actually help clean the air in your home or office? 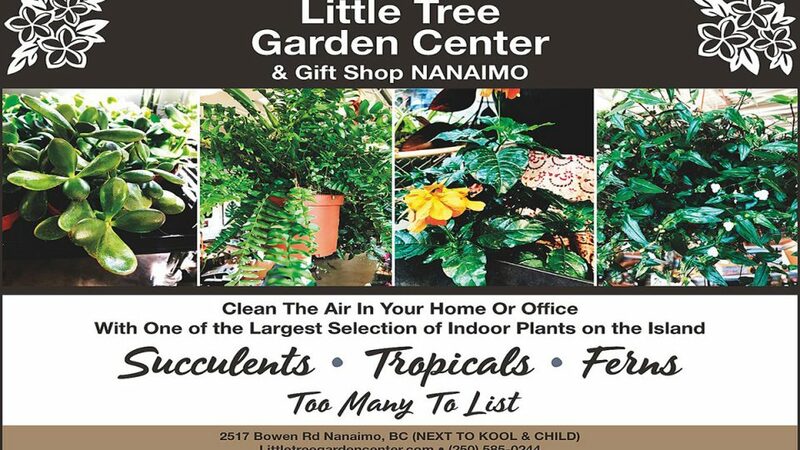 Little Tree Garden Center is home to one of the largest selections of indoor plants on Vancouver Island. Are you starting your Christmas shopping early? Come and browse a wide selection of gift items especially for the person who ‘has everything’ – we carry unique and inspiring items for the home, office and garden. Like West Coast Daily on Facebook for chance to win a night on the town, prizes, cash, & more. West Coast Daily, events, features, and local deals. Events, Features & Deals straight to your inbox! Have events, local features & deals delivered to your inbox on a weekly basis. Please note you must confirm your subscription in the follow-up email. Sign up to get our Daily Deals! Have features, specials and amazing deals delivered straight to your inbox on a weekly basis.